To mark Vertis Aviation’s second anniversary of successful trading the boutique private aviation solutions provider asked us to develop a new animated website design. This new website needed to be a significant move forward from the original version, not just in terms of raising the game with unique dynamic and aspirational imagery to support the positioning and key messaging but also in terms of technology in the fast moving world of the latest browsing devices. Improved user engagement and interactivity were also prerequisites. The brief led to Design Inc proposing an animated HTML5/jQuery website solution featuring the latest coding techniques and with graceful degradation in mind. Techniques which, we believe, will become mainstays in the the way all websites will be designed and programmed. jQuery offers many benefits in terms of moving graphics and information presentation. These features are also viewable on iPads and iPhones which has long been a shortcoming of Flash animation and interaction. The new site is powered by a WordPress content management system so it can be both easily updated and search engine optimised. It has been designed, developed and skinned however, using HTML5/jQuery features like animations and lateral navigation scrolling. This combination provides a delicate balance between a luxury/lifestyle feel and simplicity of user experience. The brief for the new generation site was to present a marketing split in the way the company is positioned. 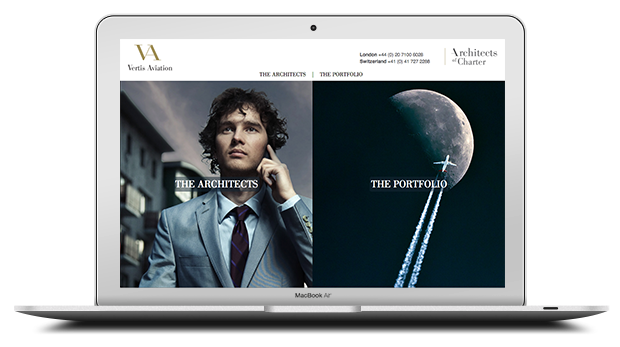 This means a landing page navigation choice for users between the independent London-based brokerage side of the business ‘The Architects’ (of Charter) and the managed fleet of heavy private jet types ‘The Portfolio’. jQuery animation would allow us to present these connections and company structure in a smooth moving and engaging fashion. After a short scene setting ‘lifestyle’ jQuery presentation, the user is invited to choose between ‘The Architects’ or ‘The Portfolio’ areas of the site. The pages move effortlessly and default to display correctly for all browser formats. So the site maintains cross platform design integrity when viewed on PC, tablet and mobile devices. Further developments planned for this new animated website are search engine optimisation and also integrating and improving the existing Vertis Aviation corporate social media to further increase the site’s social signals. To view the new website please visit www.vertisaviation.com. We provide ongoing branding and communications support for Vertis Aviation including print advertising and digital campaign design. For more information on HTML5/jQuery animation and moving website design solutions please feel free to call Dan Gilbert on 01784 410380 or email him at daniel@designinc.co.uk. Design Inc UK is a West London-based website design agency. If you’re considering an HTML5/jQuery or animated website design or development, please contact us by calling 01784 410380 or emailing us to find out more. Design Inc has considerable experience in the creation of innovative and animated website design. To learn more about our website services, please visit our web development pages.